Radio Telescopes Extend Astronomy's Best "Yardstick"
NRAO Home > Press Releases > Radio Telescopes Extend Astronomy's Best "Yardstick"
Radio astronomers have directly measured the distance to a faraway galaxy, providing a valuable "yardstick" for calibrating large astronomical distances and demonstrating a vital method that could help determine the elusive nature of the mysterious Dark Energy that pervades the Universe. "We measured a direct, geometric distance to the galaxy, independent of the complications and assumptions inherent in other techniques. The measurement highlights a valuable method that can be used to determine the local expansion rate of the Universe, which is essential in our quest to find the nature of Dark Energy," said James Braatz, of the National Radio Astronomy Observatory (NRAO), who presented the work to the American Astronomical Society's meeting in Pasadena, California. 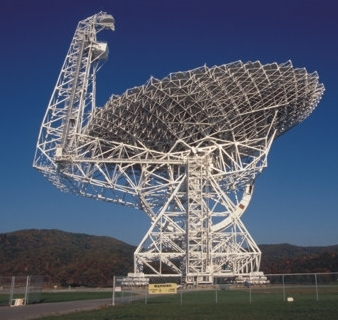 Braatz and his colleagues used the National Science Foundation's Very Long Baseline Array (VLBA) and Robert C. Byrd Green Bank Telescope (GBT), and the Effelsberg Radio Telescope of the Max Planck Institute for Radioastronomy (MPIfR) in Germany to determine that a galaxy dubbed UGC 3789 is 160 million light-years from Earth. To do this, they precisely measured both the linear and angular size of a disk of material orbiting the galaxy's central black hole. Water molecules in the disk act as masers to amplify, or strengthen, radio waves the way lasers amplify light waves. The observation is a key element of a major effort to measure the expansion rate of the Universe, known as the Hubble Constant, with greatly improved precision. That effort, cosmologists say, is the best way to narrow down possible explanations for the nature of Dark Energy. "The new measurement is important because it demonstrates a one-step, geometric technique for measuring distances to galaxies far enough to infer the expansion rate of the Universe," said Braatz. Dark Energy was discovered in 1998 with the observation that the expansion of the Universe is accelerating. It constitutes 70 percent of the matter and energy in the Universe, but its nature remains unknown. Determining its nature is one of the most important problems in astrophysics. "Measuring precise distances is one of the oldest problems in astronomy, and applying a relatively new radio-astronomy technique to this old problem is vital to solving one of the greatest challenges of 21st Century astrophysics," said team member Mark Reid of the Harvard-Smithsonian Center for Astrophysics (CfA). The work on UGC 3789 follows a landmark measurement done with the VLBA in 1999, in which the distance to the galaxy NGC 4258 -- 23 million light-years -- was directly measured by observing water masers in a disk of material orbiting its central black hole. That measurement allowed refinement of other, indirect distance-measuring techniques using variable stars as "standard candles." The measurement to UGC 3789 adds a new milepost seven times more distant than NGC 4258, which itself is too close to measure the Hubble Constant directly. The speed at which NGC 4258 is receding from the Milky Way can be influenced by local effects. "UGC 3789 is far enough that the speed at which it is moving away from the Milky Way is more indicative of the expansion of the Universe," said team member Elizabeth Humphreys of the CfA. Following the achievement with NGC 4258, astronomers used the highly-sensitive GBT to search for other galaxies with similar water-molecule masers in disks orbiting their central black holes. 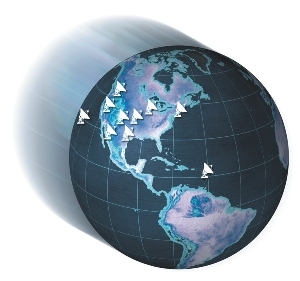 Once candidates were found, astronomers then used the VLBA and the GBT together with the Effelsberg telescope to make images of the disks and measure their detailed rotational structure, needed for the distance measurements. This effort requires multi-year observations of each galaxy. UGC 3789 is the first galaxy in the program to yield such a precise distance. Team member Cheng-Yu Kuo of the University of Virginia presented an image of the maser disk in NGC 6323, a galaxy even more distant than UGC 3789. This is a step toward using this galaxy to provide another valuable cosmic milepost. "The very high sensitivity of the telescopes allows making such images of galaxies even beyond 300 million light years," said Kuo. Braatz works on the project with Reid and Humphreys of the CfA; Jim Condon of the NRAO; Cheng-Yu Kuo of the University of Virginia; Christian Henkel of the MPIfR; Fred Lo and Violette Impellizzeri of the NRAO; Ingyin Zaw of New York University; Avanti Tilak of the CfA; and Lei Hao of the University of Texas.